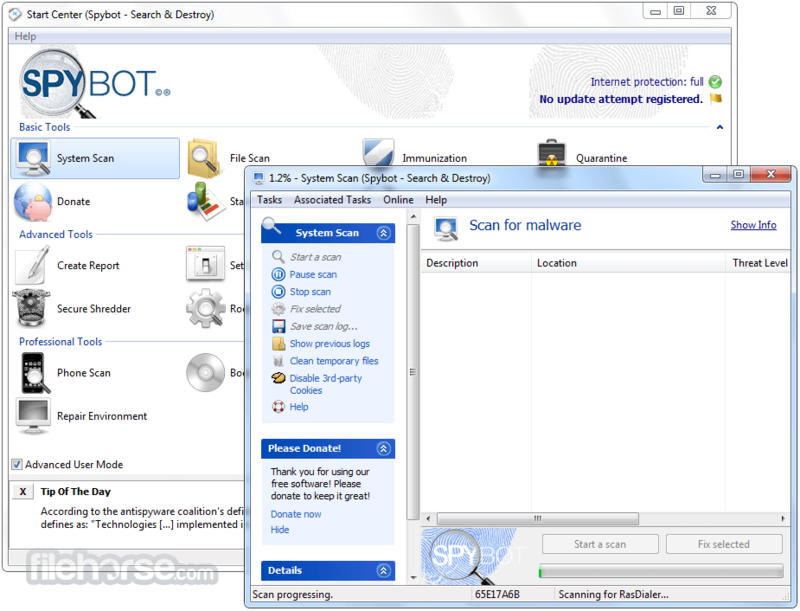 Spybot Search & Destroy is an on-demand top anti-spyware scanner and free remover for Windows PC. Spyware is software that not only gathers information about your activities on the Internet without asking your permission but also can change the configuration of your computer. The actions or information gathered by of this type of software can be used for targeted advertising and also for forcibly directing you to certain websites. 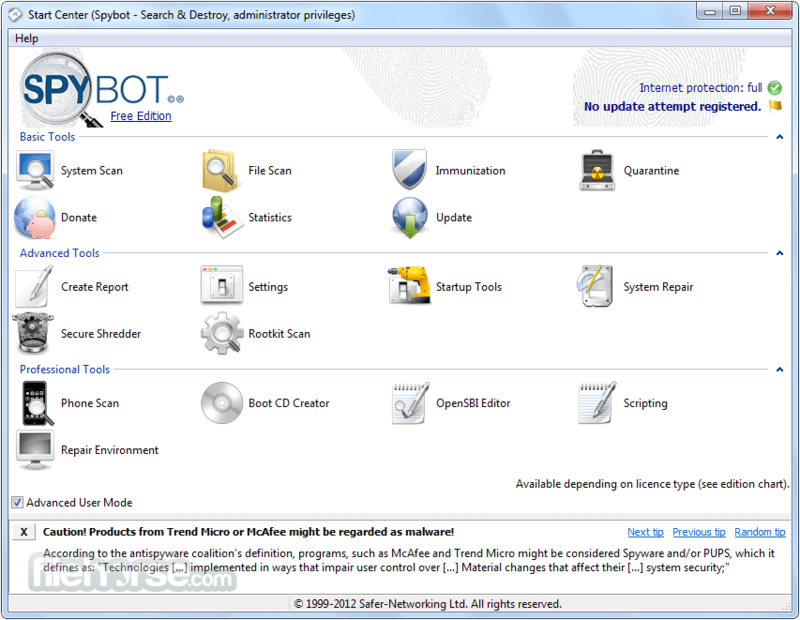 Spybot Free Edition searches your hard disk for all known types of spyware, adware and potentially unwanted programs. It offers powerful features to remove these threats and thus protect your privacy. It automatically detects adware networks, attempts at host redirection, registry modifications or unwanted changes in the browser configuration of Internet Explorer, Firefox and Opera. If an attempt is made to redirect your computer to a different name server without your permission Spybot can detect and stop this happening. Another way that Spybot protects your privacy is by removing ‘Usage Tracks’. Usage tracks are the history of websites you have visited, web pages pages you have opened, documents you have read or edited, programs you have run and other information recording your activities. This information is stored on your computer and can be useful as it can speed up access to data but it can also be used in attempts at identity theft or to compromise your computer. It can remove the Usage Tracks that could possibly cause problems if used by an attacker. Spybot`s team of ‘Forensic Detectives’ constantly monitor the Internet for new threats and attack vectors so it is important, that in order for software to give maximum protection, it is regularly updated. The signatures for the program are updated once a week. It can detect and remove a multitude of adware files and modules from your computer. 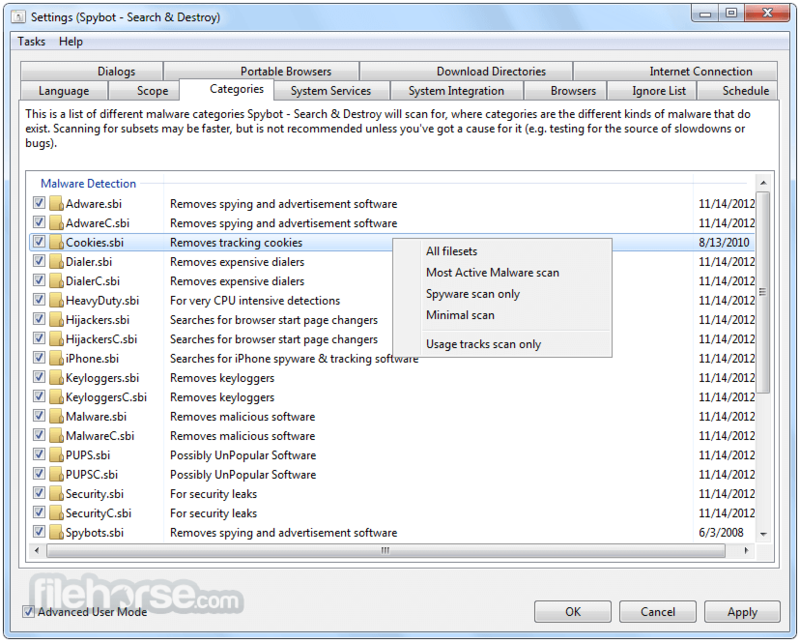 Program also can clean program and Web-usage tracks from your system, which is especially useful if you share your computer. Modules chosen for removal can be sent directly to the included file shredder, ensuring complete elimination from your system. For advanced users, it allows you to fix Registry inconsistencies related to adware and to malicious program installations. 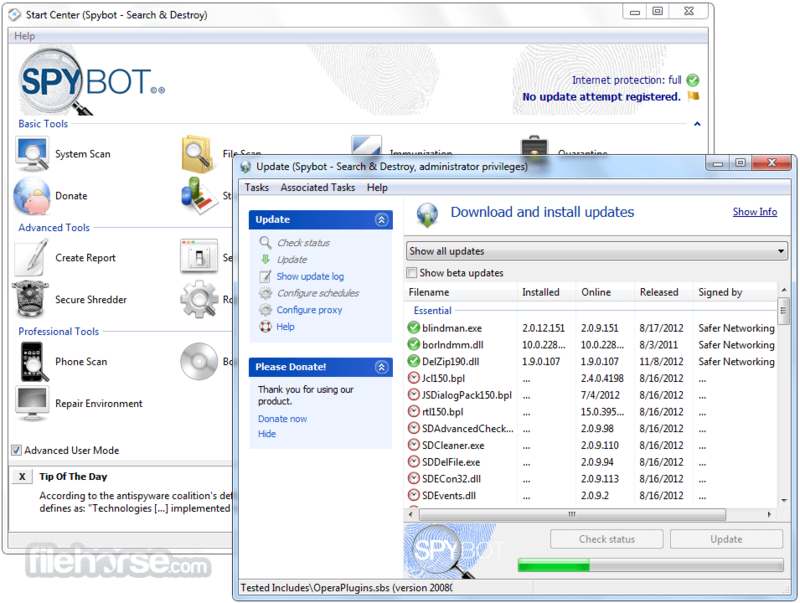 The handy online-update feature ensures that Spybot Free Edition always has the most current and complete listings of adware, dialers, and other uninvited system residents. If all you require is to be able to Scan and Remove Malware and rootkits from your system. 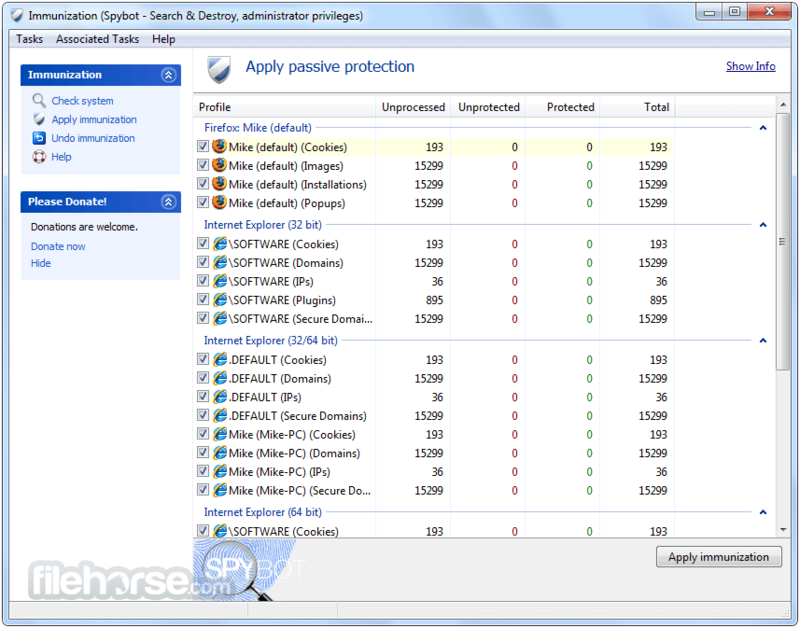 Or if you want to protect your PC by immunizing your browser and hosts file, the ‘Free Edition’ is the choice for you. If you are a more experienced user you can also check various ‘autostart’ locations using the ‘Startup Tools’. It can scan single files or specific folders and unlike other software it doesn’t matter if the file is located on your local drives or on a network share. It comes with its own whitelist which helps to identify if files are legitimate or not. This useful addition helps to speed up the scan. Even though this fully functioning product is free of charge you can still get free support by emailing to Spybot support team.